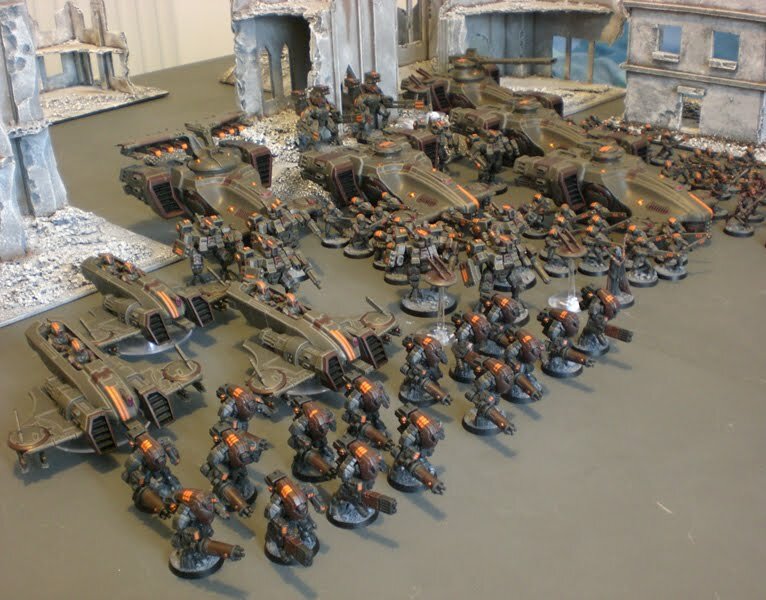 Warhammer Tau: Warhammer 40K Good Value for Money? No really, Warhammer 40K does offer good value for money. Despite the price hikes, despite the units becoming cheaper and us all having to buy more as a result, other 'normal' hobbies are surprisingly more expensive! This article started off as trying to justify the cost of my little plastic men with their little plastic guns to my girlfriend. However, I soon discovered that Warhammer Fantasy and Warhammer 40K really is quite an affordable hobby compared to video games or even going to the gym! Just take video games for example: We know that a new game costs around £40. But how long does it take you to blitz through that game? How often will you go back to that game and play through it again? Not to mention that you need to spend over £200 on a games console in the first place. So by comparison how much do we spend on a Warhammer 40K unit? About £20 to £40. And it will take us a whole weekend to build and paint said unit, much like it will take us a whole weekend to finish a video game. But how often do you play your games again once you've completed them? And unlike video games, Warhammer 40K units can be added together to build an army and be used simultaneously while video games cannot. So in the short term a Warhammer 40K purchase provides equal 'hobby time' as a video game. However in the long term, a Warhammer 40K purchase will provide more 'hobby time' as you continue to play games. Collectively, a Warhammer 40K army of say, 2,000 points will set you back in the region of £400. A games console and 5 games will come to the same amount. But will those 5 games last you longer than 5 weekends, perhaps 10? If one of them is Call Of Duty, then yes, it will have a better long term return. But you're more likely to play the Warhammer 40K army over and over for a much longer period of time. Alternatively for something a little more active, let's compare Warhammer 40K to my new gym membership. I got myself a Gold membership for just £444 (I get a special rate for being a local resident) and bought a new pair of running shoes for £70 so I don't mash my feet. So that's £514. Because this is a one-year investment, much like a Warhammer 40K army, it's difficult to count up the 'hobby hours'. But while I could spend an hour a day at the gym, I could easily spend an hour a day building and painting my army, and up to 3 hours a week playing a game. 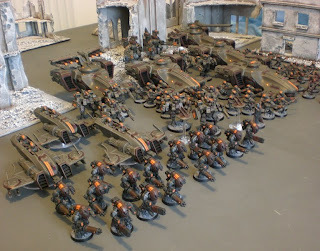 So in terms to 'hobby time' for your money, a 40K army would actually be a lot better. And this is probably the cheapest gym membership I've ever seen. Sure, £40 is a heck of a lot of money for some of the bigger Warhammer 40K tanks and it can be tough to justify the costs for our man-toys. But when you measure the value of these kits in terms of 'hobby time', then Warhammer 40K and tabletop wargames in general become a surprisingly cost effective way to make the most of our free time. I mean, why burn out your retinas playing video games or get fit by going to the gym when you can build, paint and play with little plastic dudes for potentially less? Okay, we should all get some exercise to stop us from looking like a sack of potatoes, but you get the idea. The flaw with the video games vs. Warhammer argument is that you are only factoring in the diversity and cost of buying video games new. Talking about a XBox 360, you can buy the system for ~$200 USA and get most games used for much less than retail. Also, you can rent games and usually burn thru them in a few days for a couple of dollars. (Red Box or Gamefly!) Also, most systems have secondary uses, such as Netflix, LastFM, etc. A model for 40K is purely a model for 40k. Don't get me wrong, I love spending my hobby cash on WFB & 40K, but I don't think comparing video games to the hobby is a particularly good comparison. Good points well made and I work for a video game company. Thing is if Warhammer had the market appeal of video games it would probably be a lot cheaper than it is. Another thing to think about as games get older they get cheaper mass effect costs around £5 now adays and will easily last a weekend Warhammer does only seem to get more expensive. Qoute", Warhammer 40K units can be added together to build an army and be used simultaneously"
@Equinox: I also thought of that. but consider a gamefly memebership which would cover all the games that you need. Thats still $180 a year, plus most people that I know that are "video gamers" generally get systems fairly close to the release date. On a long term basis, A new gaming system probably costs more than new army books and rulebook. I think 40k seems expensive to perhaps some skirmish games, but honestly when looking at a lot of hobbies, 40k is pretty cheap long term, mainly because you don't really "use up" a model. The cost of $40K is the single biggest reason why I sold my TAU and washed my hands of it. Of course the poor game mechanic, lack of required FAQs and the lack of variety also helped move on. I just wish the 700 or 800 dollars I spent on my TAU could've been spent on Infinity. I would have every army represented and at tournament levels too. It was fun while it lasted though, sorta. 40k is an expensive hobby, of that we all seem to agree. So are other hobbies... paintball for example. After buying the marker, helmet, and any add-ons or special gear you desire you still need to pay paint, air, and field costs each time you go out to play. Also, lots of people like RPGs just as much as "shooters" when it comes to video games. Chromehounds had a very large following until they shut down the server after MW2 came out. Even games like KOTOR, Mass Effect, and Elder Scrolls take up a lot of free time (yes my wife and I STILL play KOTOR every now and then). Even D&D tends to eat up constant weekends and you don't even need each person to buy every book! My point is that different hobbies/games appeal in different degrees to different people. Depending on who you are a good investment for someone else might not be the best idea for you. Also it depends on what you get out of it, if you love/enjoy doing something then cost becomes less of a point of contention. For example, for me personally I enjoy kickboxing and motorbiking, Kickboxing costs me £35 a month for 2x 1.5Hr lessons a week and has cost my in excess of £200 in kit (pads gloves etc). However compared to the enjoyment I get from it. The cost doesn't concern me. Equally, seeing a well painted up squad that I have laboured over fills me with a small measure of pride and accomplishment everytime I pull the models out of a carry case. Which is something I don't get from computer games. I think it's safe to say that any hobby that you're willing to invest time and money into will be expensive.